The shipping price will be determined based on your shipments weight and destination Zip code, the shipping will be billed to your credit card. This fantastic pre-fabricated Sukkah assembles in about half* an hour with absolutely no tools necessary. It is manufactured by The Sukkah Center with heavy-gauge aluminum and triple supports, yet is lightweight (35 lb. 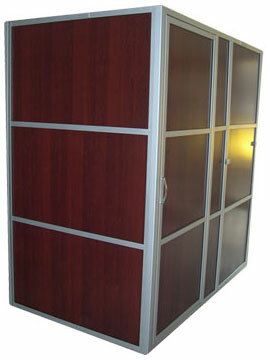 per panel) for easy maneuvering and storage. The panels easily interlock in to one another, you then place the clamp between the 2 panel to keep them together, they are available in various colors and materials. All are durable, lightweight, and weather resistant and are easily washable. The pre-hung swinging doors can be placed on any side of the Sukkah you choose. The Sukkahs come in standard 4' x 90" panels but can be order in sevral sizes to fit your specifications if necessary. Our trained and courteous sales staff will assist you through our full line of standard, and three-wall Sukkahs. Your Sukkah can always be extended simply by adding more panels. All Sukkah packages include 1 Door no Windows. The Marble Supreme Panels(the lower pictures)are made PE board with a Aluminum coating,making them longer lasting, and fireproof. adjusted in your cart once added.